Our Small Business Finance Markets 2018/19 report provides a timely, comprehensive and impartial assessment of finance markets for smaller businesses at a moment of great significance for the UK and its economy. First, there is evidence that small businesses, due to the current period of uncertainty, are either using external finance to put in place contingency plans or reducing their finance requirements as they delay longer term investment and expansion decisions. The second theme is declining demand for finance although, encouragingly, awareness and use of alternatives to traditional finance is rising. 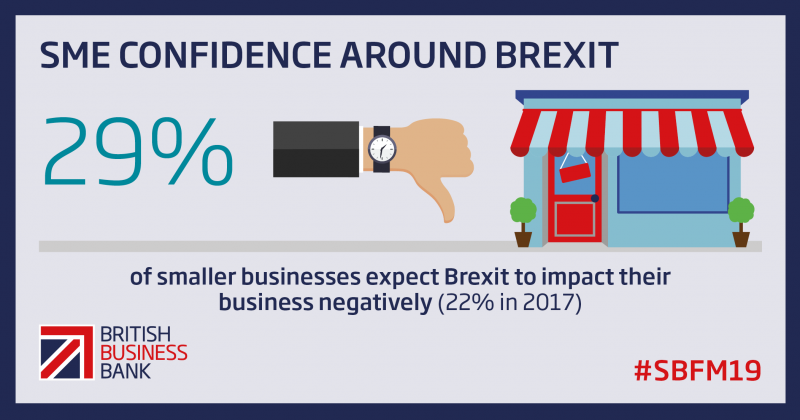 An increasing number of smaller businesses – 29%, up from 22% in 2017 – expect the UK leaving the European Union to have a negative effect on their business; a similar proportion (34%) expect it to be more difficult to access finance post-departure. Gross bank lending remained stable in nominal terms, with the gross lending closely matching repayments over 2018. Equity finance, asset finance and market-based lending have grown by 4%, 3% and 18% respectively. Just 36% of smaller businesses now use external finance compared to 44% in 2012 and over 7 in 10 firms say they would rather forgo growth than take on external finance. Awareness of alternatives to traditional finance has continued to grow, with 52% of small businesses aware of peer to peer lending, 70% aware of crowdfunding platforms and 69% aware of Venture Capital (up from 47%, 60% and 62% respectively in the previous year). Almost half (48%) of equity deals are in London despite it accounting for only around 20% of high growth firms, but clusters of high-growth and high-tech firms are continuing to develop across the UK. Evidence from our annual survey, undertaken by Ipsos MORI in autumn 2018 for the British Business Bank, is used extensively in the Small Business Finance Markets Report. The survey includes new data on the awareness and use of finance by smaller businesses, as well as information of the growth plans of those businesses and their expectations for trading conditions in the year ahead. Awareness of almost all finance products has increased since 2017, while the proportion of SMEs seeking finance and their confidence in raising finance remains broadly similar to last year. The survey conducted in the Autumn of 2018, includes new questions on invoicing and late payment. While the most common impact of late payment is on cashflow, SMEs are more likely to mitigate late payment by debt recovery than set up preventative measures. Met onze nieuwsbrief blijft u op de hoogte van de ontwikkelingen rondom kredietunies.